Soft on the inside; crispy on the outside. Bite into one today! Do you think some dishes always remind of a particular time in your life? Bread Rolls were a very frequent snack during my childhood; but ever since I left home after 10th grade, I don’t remember eating them. Surprisingly I haven’t seen them on any restaurant’s menu… there is samosa, bread pakodas, mixed pakodas, tikiya – everything but not bread roll. 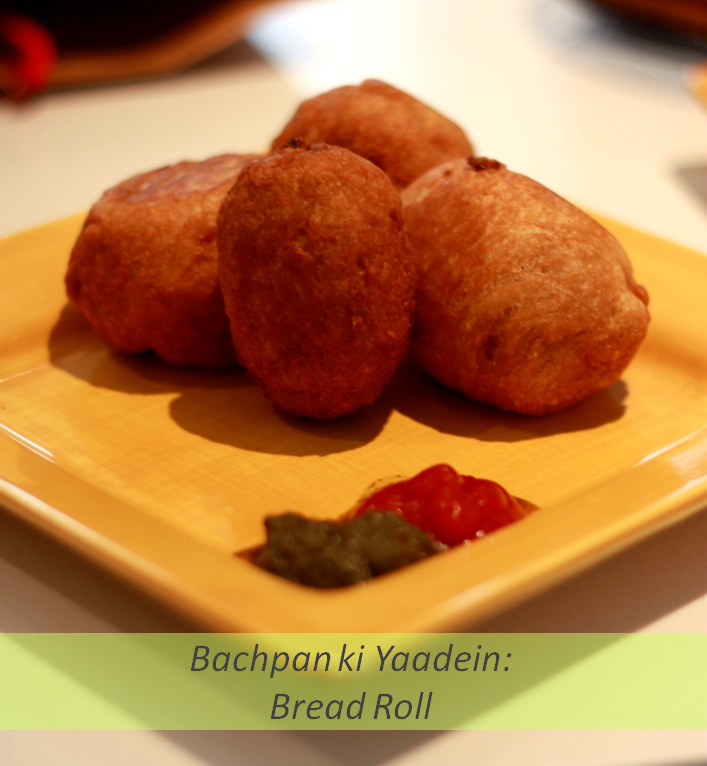 My last post on buttery potato bake reminded me of everything potato-everything tasty Indian snacks and I don’t know why, but in particular, bread rolls… However I resisted the desire to have them for long simply because they require deep frying and I don’t know when it started but sometime early this year, I had joined the healthy eating bandwagon :). Fried food definitely didn’t fit in. and then it rained! Now how much can one take… It was the first rain of the season; a relief from the sweltering heat so far; the trees looked like they have just taken a bath; the ground smelled of fresh earth and I wanted something hot, something fried, something filled with potato.. I wanted a bread roll! When the oil is hot; add asafoetida, followed by green chillies and all the spices. Stir well for about 30 seconds. Add the mashed potatoes and mix well so that the potatoes are properly covered with the spices. Cook for 2 minutes. Remove from heat and keep aside. Heat oil for frying in a deep kadhai. Fill a flat bowl with water. Taking one bread slice at a time; soak the bread slice in water; carefully press it between your palms to squeeze out all water… This can be tricky 😮 be careful not to squeeze very hard, else the slice will break, but squeeze enough to remove all water. Keeping the bread in one palm, put some of the potato mixture in the centre of the bread and fold it to form an oval ball of moist bread filled with potato mixture. Deep fry on medium heat, till the rolls are golden brown in colour. Enjoy on a rainy evening, with warm cup of tea! Which is that one dish that reminds you most of your childhood? This look yum! I can’t wait to try them! btw I know I’ve said this on your blog as well.. I’m totally in love with your tea-cups collection!! Just how much can one resist 😉 Happy Monsoons! Happy Monsoons to you too!